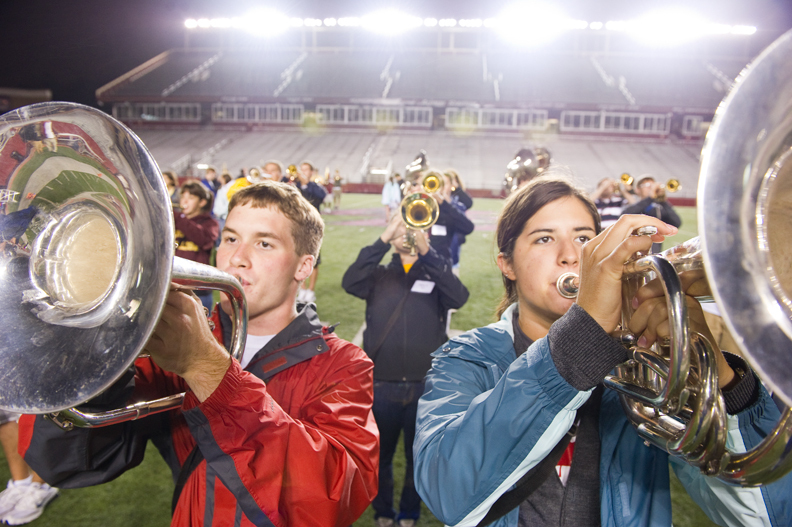 With the opening football game of the 2010 season scheduled for September 4 at home against Weber State, members of the Boston College Screaming Eagles Marching Band, including 70 newcomers, met under the lights at Alumni Stadium on a drizzly August 25 for their first full practice. Among the musicians were Ian Kates ’14 on mellophone and Sabrina Caldwell ’12 on baritone horn. The Screaming Eagles Marching Band is the largest of the University’s music ensembles, with 180 members, including color guard and dance team. It was founded in 1919 and is led by assistant director of bands David Healey. This feature was posted on Thursday, August 26, 2010 and is filed under Featured Photo.